Is it possible to use encrypted AppSettings via DynamoDbAppSettings? We have a requirement that we must store all sensitive data, like connection strings, in an encrypted form. This can be a real pain, and I was hoping DynamoDbAppSettings would help make life easier. No, none of the Configuration providers include support for Encryption out-of-the-box. 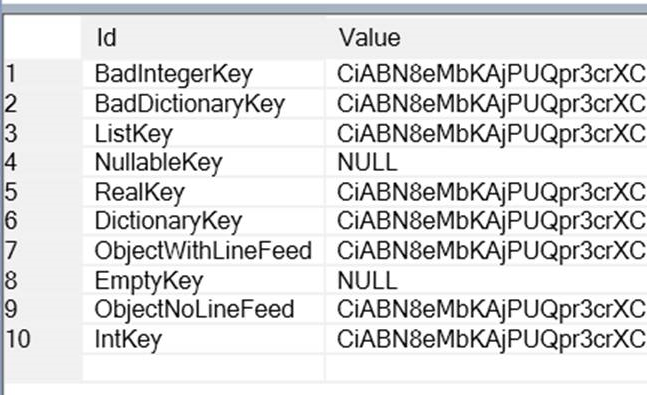 Maybe you can use the handy encryption utils in CryptUtils.cs to easily encrypt/decrypt text. IMO your best approach would be to create a custom DynamoDbAppSettings that transparently decrypt/encrypt each setting. So the new class is very similar. I used the same tests, modified for our xunit/AutoFixture set up and all tests passed. Are there any other things you can think of that might bite me later? Can I deal with my issue in the ServiceStack space, or is this standard RSA stuff (which I know little about) and requires some sort of separate server for the key? You definitely don't want to be creating a new Public/Private key each time as you would lose anything that was encrypted with any previous key pair. I also don't think you should use RSA as you're not trying to communicate with 3rd Parties, you just want to encrypt/decrypt your own data so using AES would be more suitable. Each server would just need a copy of the AES Key to be able to encrypt/decrypt the same data. You'll want to read an overview on both Asymmetric Encryption like RSA which uses a public/private key pair, and Symmetric Encryption like AES which can be encrypted and decrypted with the same key that's both faster than RSA and also suitable for encrypting large payloads. I think the docs in the Encrypted Messaging provides a good overview since it uses the strengths of both RSA and AES to communicate large payloads efficiently. I'm not totally excited about passing in the AWS ARN for the key to the encrypt method, but I didn't want to embed it in the function either, so I have it as a constant in a static class. It may well be something in our code, but our code, in a separate app outside of the Admin app, is only supposed to read the values, not write. Have you seen anything like this? Those keys look suspiciously like the keys in the App Settings Tests. So I'm assuming you've run the tests against your AWS DynamoDB instance.